Used by Olympic athletes to ease aches and pains, LumiWave’s infrared light technology is making recovery easier for consumers. After months of grueling training and trials ahead of the 2016 Olympics, members of Team USA’s vaunted gymnastics teams will use LumiWave, a wearable pain-relief device, to overcome their aches and strains in Brazil. While various Olympians have used LumiWave since shortly after the 2004 games in Athens, Greece, this year marks the first time that the wearable is available to the public, at a cost of $449.99 for the original version and $579.99 for a 400 LED “double” version. The effort to bring LumiWave from Olympic training centers to American households stretches back more than a decade, company founder Sherry Fox told FOXBusiness.com. “It was always the intent to get [LumiWave] into the hands of the general public, because I felt it was something that would be useful in every home,” said Fox, who now serves as chairman of the board of LumiWave’s parent company BioCare Systems Inc.
LumiWave is entering the public marketplace during a period of intense competition in the United States’ booming wearable technology industry, as major players like Under Armour (NYSE:UA) and Nike Inc. (NYSE:NKE) compete against upstarts like Fitbit (NYSE:FIT) for market share. The wearables market will reach $14 billion this year, with sales expected to rise to $34 billion by the year 2034, according to research firm CCS Insight. The device uses an array of LED-powered infrared lights to stimulate blood flow and the natural healing response. The device, when used pre- or post-workout, can naturally relieve pain caused by tendonitis, muscle strains and other types of soft-tissue injuries, allowing athletes to bounce back faster from their workouts and recover quickly without the use of medication. While LumiWave costs more than the typical health or fitness-related wearable device, company executives say it’s a bargain compared to similar treatments used by chiropractors or athletic trainers. “What we’ve done is taken an array that’s normally seen on a professional device that a physical therapist or a trainer would have, costing $4,000 to $6,000, and we’ve brought that into a consumer-friendly price range,” said Jon Weston, CEO of BioCare Systems. The wearable’s users include figure skater Evan Lysacek, who took gold at the 2010 Summer Olympics in London, and biker Jill Kintner, who overcame a serious knee injury to win bronze at the 2008 games in Beijing. Professional teams and players from Major League Baseball and the National Football League also use LumiWave. LumiWave gained clearance from the U.S. Food and Drug Administration in 2005. Weston made contact with the U.S. Olympic Training Center in Colorado Springs that year and provided trial versions of the device, which received positive feedback from the facilities’ trainers. Team USA’s softball, swimming, skiing, skating and gymnastics teams have all incorporated LumiWave into their rehab programs since 2005. While infrared treatments aren’t a miracle cure for injuries, they do place athletes on a “best case scenario” timetable for recovery, according to Vinny Comiskey, a San Diego-based athletic trainer who worked for the U.S. Olympic Committee for 18 years. The treatments allow athletes to manage pain without using anti-inflammatory medication or opioid-based painkillers, which have come under increased scrutiny in recent years for their debilitating side effects. “We found that [with LumiWave] we were able to get into an injury a lot faster and help stimulate the healing response versus waiting for the area to settle down,” Comiskey said. Kintner, the Olympic biker who won a bronze medal in the women’s BMX event in Beijing, suffered an ACL injury that impacted her training for the 2008 games. Comiskey, who worked directly with Kintner at the time, said LumiWave played a key role in allowing her to train at a high level while managing her pain. 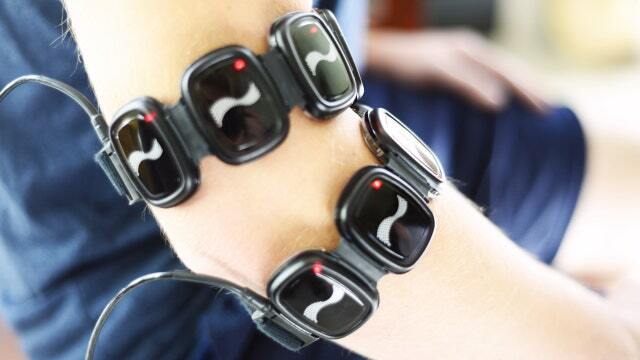 While use of LumiWave over the last decade has mostly been limited to elite athletes, Fox asserts that the device can be helpful to anyone with an active lifestyle or a need to treat aches and pains, including hikers, golfers and older individuals with arthritis.